Evinrude's multi fuel outboards are giving us a tantalizing glimpse into the future. The Wisconsin-based company builds direct injected two-strokes with EFI mapping programmed to burn diesel, jet fuel ( JP-4, JP-5, JP-8 Jet-A and Jet-B), kerosene, or bio diesel as well as common gasoline. Fuel selection is no more complicated than the flip of the switch. 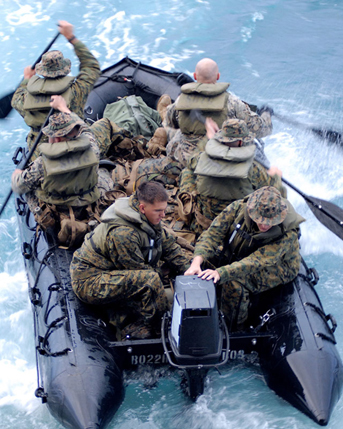 Multi Fuel Engine (MFE) technology allows the U.S. military to transport outboards via aircraft or ships without having to deal with volatile gasoline fumes. That's important because gasoline is forbidden aboard U.S. Navy ships (the US Department of Defense Common Fuels Initiative). 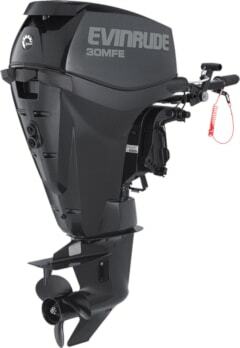 While the MFEs are not designated as Evinrude E-TEC engines, E-TEC technology is incorporated throughout, including E-TEC injectors, the fuel system and an onboard computer. Other innovations include special cylinder sleeve oiling, modified deflector pins and mapping strategies. Note the combustion chamber has been significantly re-contoured in order to burn a multitude of carbon-based fuels. 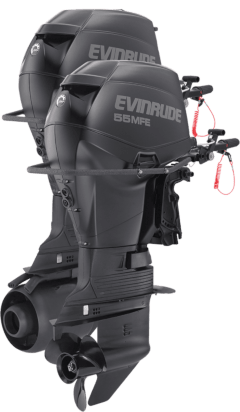 Affectionately known among the engineering staff as the Vindicator, the Evinrude 55 MFE is available with either a conventional propeller or an impeller-equipped jet pump. Built to U.S. military specifications, the pump jet is a large impeller unit attached to a full gear case that provides superior thrust and performance when compared to conventional jet pumps. Painted matte tactical black, the two-cylinder 55-horsepower MFE is rope started with a conventional break-down tiller steering arm. Created for stealth operation, MFE boasts minimal engine noise and low exhaust emissions. The multi-fuel outboard and its boat can be launched form a submerged submarine or airdropped from a helicopter or C-130 Hercules cargo plane. It's narrow enough to fit inside a torpedo tube. A wrap-around handle makes for easy lifting and carrying. It is submersible and boasts a de-watering system that purges the powerhead and undercowl area. That means it can be hidden in a swamp by a raiding party until its return. Beyond multi-fuel flexibility what really gives E-TEC value in a tactical, or third world, setting is the zero break-in time. Right out of the box they can be started and run at full throttle without babying. And because they are extreme low maintenance their survival rate is greatly enhanced, a trait that's especially important in high stress environments. Evinrude 55 MFE engines fitted with the jet pump power the United States Marine Corp's fleet of FC-470 Zodiac boats and Combat Rubber Raiding Craft (CRRC) used during small craft operations. They are also available to civilians.